Golf legends Old Tom Morris, Harry Colt, Harry Vardon, James Braid and Willie Park Jr all sprinkled their magic to help shape iconic duneland links and scenic parkland layouts that have stood the test of time, some rating among the world’s best. Almost a dozen golf clubs boast a heritage dating back more than a century, while golfers can also play by a former stately home, a 17th century castle, the ruins of a friary and the world’s oldest clubhouse. 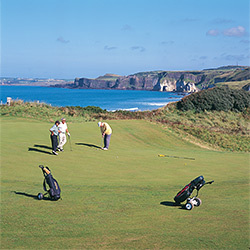 However, while history abounds on the golf courses of Northern Ireland, this northerly part of the island of Ireland is also very much looking to the future, with the recently-completed revamp of a revered links course and the redevelopment of the clubhouse at the golf club where Rory McIlroy learnt to play highlighting continuing investment in the game. Royal County Down’s Championship Links, ranked the world’s best golf course by Golf Digest magazine, has been worked on by several famed architects. Old Tom Morris was brought in to extend the original nine holes course to 18 holes through dunes below the Mourne Mountains in 1889, for the princely sum of £4, while Harry Vardon and Harry Colt subsequently made changes, some holes later being modified by Donald Steel. Royal Portrush Golf Club (pictured), host of The 148th Open in 2019, was founded in 1898 with two 18-hole courses. Its celebrated Dunluce Links was redesigned by Harry Colt in 1932. Its 17th and 18th holes have been replaced by new 7th and 8th holes, created from two holes of its sister Valley course, to allow for the spectator village area at The Open. Royal Portrush previously held The Open in 1951, when Max Faulkner won. Two-time Open champion Willie Park Jr was responsible for one of the makeovers of Portstewart Golf Club’s Strand Course, which lies just 15 minutes from Royal Portrush and which staged the 2017 Dubai Duty Free Irish Open. Its 54 holes of links golf include the Riverside Course and the original Old Course, dating from 1894. Castlerock Golf Club, across the River Bann from Portstewart, is another historic club with illustrious connections. Scottish pro, club maker and architect Ben Sayers laid out the 18-hole Mussenden Links in 1908, with Harry Colt making changes in 1925. Six holes have just been revamped in extensive changes intended, according to architect Martin Hawtree, to make it feel and play like a true links. Northern Ireland boasts several more centenarians. They include: Massereene Golf Club, established in 1895 on the shore of Lough Neagh; Newtownstewart Golf Club, founded in 1914 on the Baronscourt Estate, home of the Duke of Abercorn; Tandragee Golf Club, dating back to 1911 on the Duke of Manchester’s Estate with bunkers including some resembling America’s Great Lakes that were designed by the Cincinnati-born Duchess of Manchester; and Omagh Golf Club, which was extended from a nine-hole course built in 1910 to 18 holes in 1983. After a round on the short but spectacular Ardglass Golf Club links, hugging the rocky shore and cliffs close to Royal County Down, golfers can raise a glass in the bar of the world’s oldest clubhouse, built as a castle more than 600 years ago and with cannons pointing out over the fairways just in front. Kirkistown Castle Golf Club, on the Ards Peninsula, was designed by legendary architect James Braid, while Ballycastle Golf Club lies opposite Rathlin Island on the Causeway Coast next to the ruins of 500-year-old Bonamargy Friary. Northern Ireland Open host venue Galgorm Castle Golf Club is laid out through mature wooded grounds in the heart of the 220-acre Galgorm Castle Estate, alongside its 17th century castle. Foyle Golf Centre, on the outskirts of Derry below the Donegal Hills, features a championship course named after aviation pioneer Amelia Earhart, the first woman to fly solo across the Atlantic. She made an emergency landing at the end of her historic flight in 1932 on what is now the 6th green of the Earhart Course. Royal Belfast Golf Club, only 15 minutes from Belfast city centre, was founded in 1881 and is Ireland’s oldest golf club. It was granted royal patronage in 1885 by Edward, Prince of Wales, the future King Edward VII. The club moved to its present location on the shores of Belfast Lough after World War I and its new 18-hole course was designed by Harry Colt, opening in 1926. Also in Belfast, Holywood Golf Club is where mercurial champion in Rory McIlroy honed his skills as a youngster. A special area of the clubhouse is a shrine to the club’s favourite son, with memorabilia including photographs of his early years playing there and replicas of the US Open and US PGA trophies. The clubhouse has been undergoing major renovation to add a new gym and indoor practice facilities. A new 18th green and floodlit putting green have also been created. Away from the fairways, Northern Ireland has many other historic attractions for golfing visitors to discover. Its castles include Belfast Castle, Carrickfergus Castle on the shore of Belfast Lough, royal getaway Hillsborough Castle in County Down, Upper Lough Erne’s neo-Tudor Crom Castle and Enniskillen Castle, on the banks of the River Erne. Enniskillen’s Portora Royal School, five minutes from Lough Erne Resort, boasts playwright Samuel Beckett and writer Oscar Wilde among its alumni, celebrated in blue plaques on the school’s front wall. The Titanic Belfast attraction tells the story of the world’s most famous ship alongside the dock where she was built, while Belfast’s Titanic Quarter also contains the liner’s restored tender, SS Nomadic, and World War I museum ship HMS Caroline.